BIVALVE, Md.– It has been more than a decade since the launch of the annual Nanticoke River Multisport Festival at Cedar Hill Marina in Bivalve, Maryland. The annual event, which will take place this Sunday, May 6, gives athletes from all walks of life the opportunity to showcase their physical skills during the nearly 20-mile course. The event has been a hit since its conception in 2008, which aims to bring sport to the area and give back to the community. The Nanticoke River Swim and Triathlon board, a 501(c)(3) nonprofit, has donated roughly $100,000 to local organizations over the last 10 years. A sanctioned USA Triathlon event, the Nanticoke River Multisport Festival offers athletes an opportunity to earn points toward national standings, and to qualify for regional, national, and international competitions. The 18.5-mile course will begin with a half-mile swim starting at the beach at Cedar Hill marina. Athletes will then begin a 15-mile bike ride through Bivalve and Whitehaven before a 3-mile sprint to finish the course. 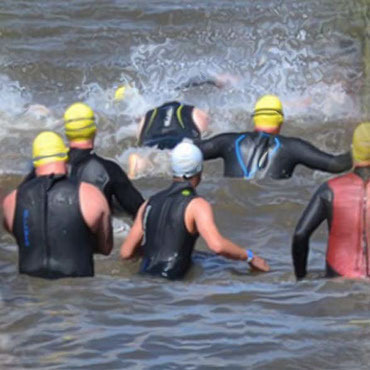 New to the event this year are the Aquabike (swim-bike) and the duathlon (run-bike-run). There will be multiple areas around the course to cheer on competitors. The event will also conclude with “the best post-race party on the shore” which will include a cookout and music during the awards ceremony. Awards and Post Race Party: Stay and Celebrate with the best post-race party on the shore!